We are presenting Bottom Navigation android which is included in latest support-design library. Bottom sheet comes with two implementations Bottom Sheet Behavior and BottomSheetFragmentDialog. Modal bottom sheets are alternatives to menus or simple dialogs. They can also present deep-linked content from other apps. They are primarily for mobile. Persistent bottom sheets present in-app content. Elevation distinguishes modal from persistent bottom sheets. Modal bottom sheets rest at a higher elevation than the app’s content; whereas persistent bottom sheets rest at the same elevation as the app and integrate with its content. On larger screens, where space is less constrained, using alternative surfaces and components such as simple dialogs and menus may be more appropriate than bottom sheets. Bottom sheet comes with two implementations BottomSheetBehavior and BottomSheetFragmentDialog. BottomSheetBehavior unifies the concept that any view can be persistent bottom sheet. Under the hood, it searches for the view that has this behavior, like any other behavior, once it finds it the target view is given to the parent to be laid out. If you have supplied the attribute behavior_peekHeight it applies how much the sheet will be visible upon laid out. To me, this BottomSheetBehavior is like sibling of the AppBarLayoutBehavior, but only the other way around. 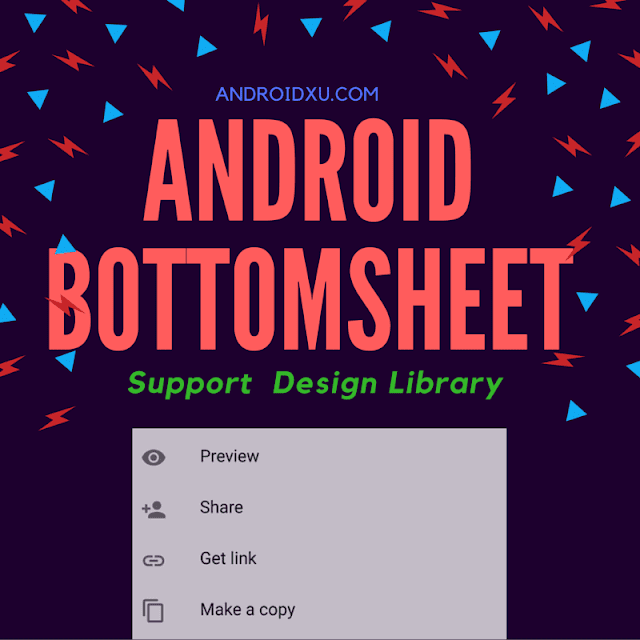 BottomSheetBehavior uses ViewDragHelper that will do the offseting the target view, from the view rect being collapsed to expanded, contrary to theAppBarLayout being collapsing the view. BottomSheetFragmentDialog is handy when you want to implement themodal version of the material design bottom sheet concept . Basically, this just wraps your dialog content view inside CoordinatorLayout and appliesBottomSheetBehavior to the holder of the dialog content view. Now we have our app material ready. So let’s start adding and building the layout file to demonstrate Modal as well as persistence bottom sheet. Open the layout file of main activity (res->activity_main.xml) and add below layout code. Add a recyclerview by creating a new blank layout file rowsheet_main.xml. Create a BottomsheetAdapter.java which will extend the recylerview to hold the recyclerview . * Created by venkatesh on 20.06.2016. Finally add the below code and paste to the mainactivity.java .